Twitter shut down anonymous posts on an internal question-and-answer forum last year after an employee anonymously questioned Twitter’s support of LGBTQ causes, according to four former and current Twitter employees who spoke with Gizmodo on the condition of anonymity. The decision came after the forum had also been used to question CEO Jack Dorsey’s leadership and widespread layoffs at the company. The incidents highlighted the ways anonymous questions could be used and abused in a workplace setting—to question labor practices and to advance disparaging viewpoints about fellow employees. Until fall 2016, the message board, called Falquora, allowed employees to use pseudonymous accounts, in keeping with Twitter’s external policy of not requiring its users to post using their real names. On the platform, which is still in use but now requires employees to use their real identities, employees can upvote or downvote questions and the most popular ones get answered during Tea Time, Twitter’s all-hands meeting. The system is similar to question-and-answer platforms used at other major tech companies like Google and Facebook. “Employees at Twitter have various resources through which to discuss matters that are important to them, and there are ways to voice issues anonymously if they choose to do so,” a Twitter spokesperson said. The spokesperson declined to comment on the Falquora questions that led to the decision, citing a company practice of not commenting on internal matters. Shortly after Dorsey returned to the company he founded in 2015, he announced the layoffs of more than 300 people. The layoffs were messy, three sources told Gizmodo. Some employees learned they were let go because their email accounts stopped working and Twitter quickly hired for some of the engineering roles it had just emptied. 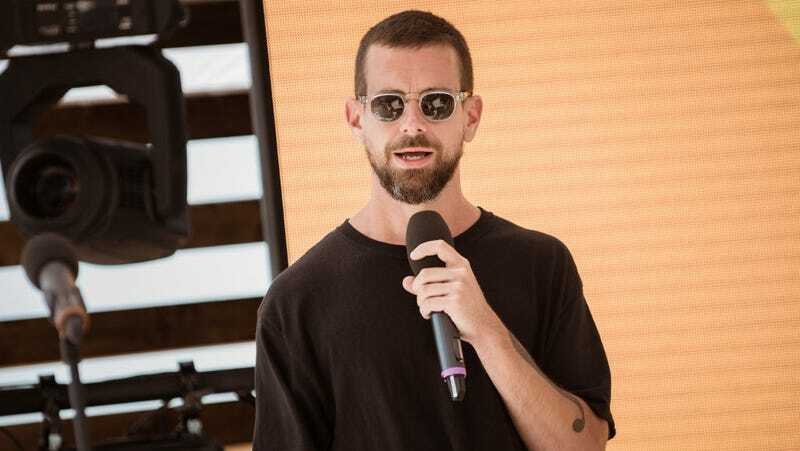 Employees took to Falquora with pointed questions about Dorsey’s decision to split his time between Twitter and Square, where he is also the chief executive. Those questions carried into fall 2016, as Twitter braced for a second round of layoffs, sources said. “Jack wasn’t very visible at HQ and when he appeared he was very withdrawn and introverted. [Chief financial officer Anthony] Noto makes most big decisions about the direction of the Twitter and employees rely more on him for guidance,” a former Twitter employee said. The conversations became heated and, in some cases, unproductive. One of Twitter’s core values it expects employees to follow is “communicate fearlessly to build trust” but discussion on Falquora seemed to focus more on anonymous, fearless questions and less on building trust among coworkers, a source explained. But according to sources, the final straw for anonymity on Falquora wasn’t the discussion of layoffs, but an anonymous question in which the writer suggested personal discomfort with the advancement of LGBTQ rights. The question sparked backlash among other Twitter employees, some of whom raised their concerns with human resources, a source said. Eventually, company leadership announced in August 2016 that anonymous questions would no longer be allowed on Falquora. Twitter’s second round of mass layoffs came in October. Twitter is just the latest company to take an anonymous forum away from its employees—Facebook shut down an anonymous employee resource group, FB Anon, in December after it became a source of offensive commentary from supporters of Donald Trump, the Wall Street Journal reported. FB Anon had been an active forum for employee discussion that was promoted on flyers around Facebook’s campus, and was initially used not for political debate but to discuss compensation and work-life balance, a former Facebook employee told Gizmodo. But the tenor of the conversations there changed after the election. Some Twitter employees who spoke with Gizmodo viewed the anonymity ban on Falquora the same way—they felt that the tool had the potential for abuse and that faceless commentary had no place in a professional environment. They said Dorsey and other leaders in the company still face tough questions on the platform, and that allowing anonymity initially allowed employees to grow comfortable with asking hard questions. But others resented having anonymity taken away from them and worried that managers might retaliate against them if they questioned leadership using their real names. Tech companies rallied last week to boot the neo-Nazi website Daily Stormer from their platforms, prompting debates about how such companies should regulate speech, both externally and internally. Some tech workers have seen the disappearance of anonymous workplace forums as a stifling of conservative speech. James Damore, an engineer at Google who was fired after Gizmodo published a memo he distributed inside the company arguing that women are biologically ill-suited for engineering roles, says that Google stamped out discussion of his views. Google’s internal Q&A system, Dory, does not allow anonymous posts, and Damore published his memo internally using his real name. But a current Google employee and self-identified Trump supporter told Gizmodo that, although Googlers who support Trump feel unwelcome at work, anonymous discussion of politics won’t solve that problem. Tech companies should instead allow political debates and make sure that employees with different viewpoints feel comfortable participating, the employee said. Using real names for internal forums comes with its own problems—Google CEO Sundar Pichai had to cancel a company-wide town hall to address Damore’s memo after Dory questions leaked online and the employees who posted them became targets of harassment. As debates about whether or not tech companies should regulate speech on their platforms continue, employees of those companies are also questioning how they should (or shouldn’t) be allowed to express their views at work.